This week companies across the UK are campaigning to highlight the benefits of apprenticeships to British business, during the tenth annual National Apprenticeship Week (#NAW2017). At David Nieper, luxury fashion house in Derbyshire apprenticeships have always played a vital role throughout the company’s 55 year history. The business has prioritised skills and training to allow specialist manufacturing skills to be passed from experienced staff onto the young generation and has committed to further expanding its Sewing Academy with up to £500,000 to be invested in training new recruits over the next three years. 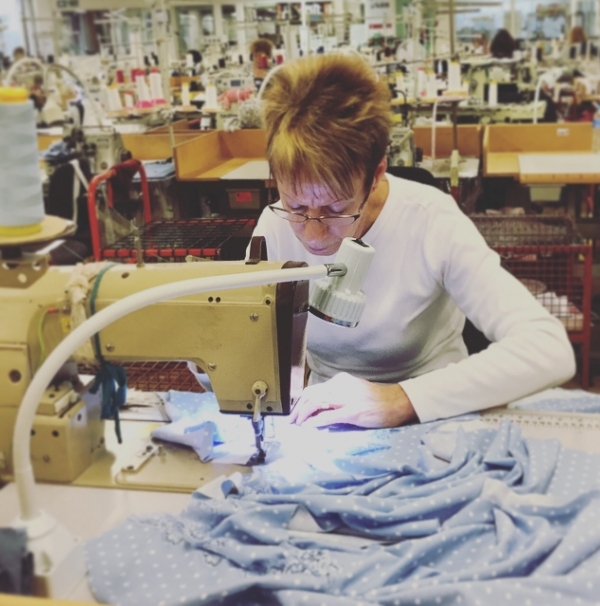 In the sewing rooms, the longest serving member of staff is Alfreton lady, Moira Guest a highly skilled dressmaker and a living, breathing example of the success story of apprentices at David Nieper. Moira started her career as an apprentice in 1969, when her Headteacher found her a position as junior machinist at the David Nieper fashion house. At age 15, she started work in a team of 20 dressmakers in an old Nissan hut in Alfreton, a far cry from David Nieper’s modern sewing rooms and 250 +staff working on the same site today. However, some things never change and Moira still uses the same skills she learnt during her apprenticeship in her work every day. Moira commented: “The best way to learn is from other people and have your work critiqued. You can read a book or be instructed a hundred times – but you need to actually do the job, make mistakes and have someone with more experience assess your work, then you never forget. I still use the same skills that I learnt as an apprentice in my everyday work – lockstitch to hem cotton and cross stitch to attach lace detail onto nightwear, it’s just become second nature to me. Working with skilled people right from the very start means you don’t develop any bad habits and ensures that whatever you are making is done to the highest standards. I am now very critical about how everything is made from clothes to household goods; I can’t help but examine how it is put together. “Our business has been built on apprenticeships and from highly skilled people like Moira learning and then passing on their specialist skills to the younger generation. Our experienced supervisors most of whom have been with us for over 20 years do an excellent job in keeping quality standards high so that our young apprenticeships learn best practice.